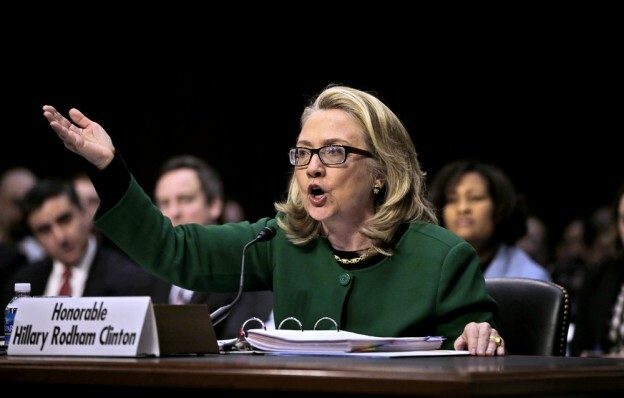 A new report claims advisers to Hillary Clinton helped sift documents related to the Benghazi attack before they were handed over the review board tasked with investigating the incident. The story by Sharyl Attkisson is based on an interview with former Deputy Assistant Secretary of Near Eastern Affairs Raymond Maxwell. Maxwell was one of four individuals who were eventually placed on administrative leave, the only accountability that ever took place for the failure to secure the Benghazi compound which ultimately resulted in the deaths of four Americans. When the Accountability Review Board began collecting documents related to the incident, Maxwell learned that there was a Sunday night work session being held in the basement of the State Department headquarters. Though he worked in the division tasked with collecting the documents, Maxwell was not invited to the session. He decided to go anyway. floor in a bad light.” When Maxwell asked if doing so was ethical the officer manager replied, “Ray, those are our orders.” Seventh floor is shorthand for then Secretary of State Hillary Clinton and her top advisers. The report eventually issued by the ARB was criticized for failing to hold accountable any high level State Department employees. Maxwell tells Attkisson it was, “a shoddily executed attempt at damage control.” While he can’t say for certain what the ARB reviewed, he believes documents turned over for the investigation had all been scrubbed in that basement office to protect Mrs. Clinton. The State Department tells Attkisson that Maxwell’s allegations were “totally without merit.” Neither Hillary Clinton nor her former advisers Cheryl Mills or Jake Sullivan would comment for the story. Maxwell retired from the State Department. The other three individuals who had been placed on paid leave–Charlene Lamb, Scott Bultrowicz and Eric Boswell–have all returned to jobs in the State Department having never missed a paycheck.